How come (in my limited experience) i have never seen a XμF/400V "motor run" capacitor in use on a SSTC/DRSSTC? I was looking at an old 1KW Inverter board and i noticed than it used two of those MKP caps, in the classic plastic white can form, right in the middle of 12xIRFP350 MOSFET (output) devices, for snubbing perhaps? Based on their size compared to the usual MKP caps used, i would say they would do better at least thermally, right? I don't know how well they would do in high frequencies or with high-current pulses, they just seem so "beefy" to me, compared to the usual "X2" and other MKP types usually used (and at the same or lower price too). For example, Mads Barnkob's SSTC II uses 2x0.68μF/400Vac MKP X2 caps (=1x1.36μF/400Vav) for DC blocking, while in his DRSSTC III he uses two 2μF/1KV for snubbers. Could one use a 1-2μF/440Vac Motor Run Capacitor as substitute in the first case and perhaps two (or more) 4μF/440Vac is series for the second? I 'm not asking because i have something particular in mind, just curious since i saw those white MKP's on that inverter. Re: Why no one uses MKP "Motor Run" Capacitors? 1. Voltage. You need to string together many of them to get a high enough voltage for even low-voltage DRSSTCs. It would be difficult to balance the voltage over this many caps, as well as very cumbersome. 2. Capacitance. The capacitance is too high. Again, you have to place many in series to get a decent capacitance. 3. Form factor. The capacitors used for snubbers or DRSSTC tend to be axial lead, longer, and thinner, so that these can tolerate a higher peak current. While the current travels along an axial capacitor, it has to travel up and back through a long radial capacitor. 4. Average vs. peak current rating. Snubbers are rated specifically for high peak currents, while motor run capacitors generally are not, because these operate at 50/60 Hz. This is related to the form factor. 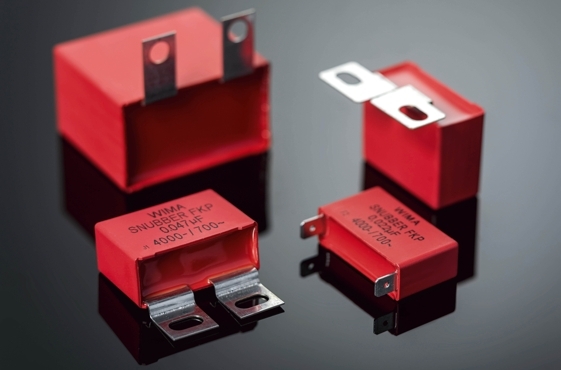 In general, I would say a good capacitor for DRSSTC is rated for at least 630 VDC, but preferably for 2 kVDC or more and can tolerate a voltage rise of 1000 V/us or more, and is polypropylene or mica for low ESR. Remember, the capacitor is going to be charging and discharging every few microseconds during the pulse! I assume that in the first two reasons (Voltage and Capacitance) you are referring to the caps used as a "tank caps", in an MMC? I didn't mentioned that use in my first post because i could see how the things you wrote are true. I was thinking of snubbers or DC blockers use only. I never thought of how the radial vs axial design of the cap would affect the current flow through the cap, i guess this is one of the things that matter when you are pulsing current at KHz frequencies, now i know! Again not talking about MMCs. The peak current and behavior at high frequencies (ESR/ESL etc) was my main concern like i wrote in the first post, but i thought that there was a good chance they were good with current (at least at 50Hz?) since they seem to be 3-4 times the physical size of "not best-for-this-use but it will work" X2 and similar non-snubber specific MKP caps. Clearly the caps that are actually made for use as Snubbers (and other "pulse-rated" variants) will out-perform all other (cheaper) alternatives, like X2 or other MKP caps. My reasoning for the current capabilities was my (very limited) experience with DC Electrolytic caps, where two caps can have the same eg 10.000μF/63V rating, but one is a snap-in cap and the other a big-can with screw terminals and 3-4 times the size of the first one. In my, again limited experience, the physically bigger cap will be able to perform better as a smoothing cap in a power supply when it comes to current: the physical smaller cap will get worm and/or not be able to supply the current the big cap has no problem providing. May i make another guess and say that you prefer 2KV rated caps for use as snubbers, because they would last longer in what i assume is a assumed 325V DC bus? I don't have much experience with resonant circuits and things like that, besides knowing that you will fry stuff if you don't use a freewheeling Diode in a DC Relay and that the collapsing current through a eg 12V DC Relay coil like that, can create a high enough voltage to shock you. But seeing many (?) small/cheapreasonably-priced coils use X2 or 400-600V caps in parallel to the DC bus, i though that the (very fast) freewheeling diodes* on the MOSFETs/IGBTs where making a good enough job so that a <1KV rated cap was all you needed. Anyways, you live and you learn and i am happy about that! Hi Dr.Krieger and welcome to HVF! Rated Voltage: Rating is the 50/60Hz RMS voltage for a sinusoidal waveform. Frequency: 50/60 Hz. For higher frequencies use General Purpose AC Capacitor Series. Voltage rating is only for sinusoidal waveforms, almost everything other than the resonant current in a DRSSTC is far from that. Frequency rating already here points from the manufacturer to use GP AC capacitors. They have a very low operating temperature to even stay in their expected life time (60000h with 94% survivors). The dissipation factor of 0.1% is high for a mains frequency rated capacitor when you think about what kind of losses it will then see at higher frequencies. That being said, I still want to make a MMC of those I got. Hi Mads, love your coils and web page!